Panasonic has unveiled the official HDR10+ logo at its press conference at IFA 2018. Until now, we've been given a boring black-and-white type logo, but the official look has a nice splash of color, pointing to the picture enhancements the technology offers. HDR10+ was first revealed at IFA 2017, so it's fitting that, a year later, the logo has been revealed alongside news on what products will actually make use of the technology. 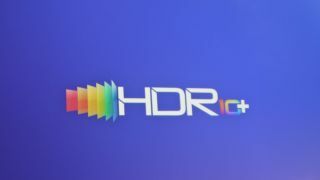 HDR10+ is big business for Panasonic, as it's a technology it created in collaboration with 20th Century Fox and Samsung. The idea is that it is more open platform than its rival Dolby Vision, which in turn makes it cheaper to implement and use. Just recently, Fox announced that it will reveal its HDR10+ content soon and Warner Bros has already revealed that much of its 4K Blu-rays will have the technology. Amazon Prime Video is another place that has adopted the the technology.